Bruce Hopkins plays Gamling, a leader of the Rohirric soldiers. Bruce Hopkins was born on November 25, 1955 in Invercargill, New Zealand, a town located on the smallest, southernmost island, Stewart Island (also known as Raikura). He was named Raymond Bruce Hopkins, though he dropped the Raymond quickly. Three years later, Bruce, with his family, moved to Russel, NZ in the Bay of Islands region. Throughout school, Bruce enjoyed crayfishing, waterpolo, rugby, basketball and surf lifesaving. He won several awards including a bronze medal at the national level for surf lifesaving and being an NZ schoolboys representative for waterpolo. When he was in high school, Bruce travelled to America as an exchange student and attended South Tama County High in Iowa. Bruce for a spell, was a crayfisherman like his father and also trained to be a physical education teacher, but his eight year career as a professional dancer led him into the performing arts. He danced with several companies in Australia and New Zealand, including Limbs Dance Company, Impulse Dance Theatre and Sydney Festival Dance Company and Black Grace Dance Company. Finally, Bruce landed his first role as Diesel, a member of the Jets in a production of Westside Story by Mercury Theatre Company. The show sold out for all seven weeks that it played and led Bruce to pursue his career as a freelance actor. Bruce has been performing successfully in live theatre and film. He is also a voice artist, professional emcee and member of the comedy duo “Des & Les,” formed with a old boyhood friend. Bruce has acted in Mercy Peak as Colin Mitford(TV, 2001), several appearances in Xena: Warrior Princess, all three Lawless as Andy Deakin (1999-2001), Jubilee as Larry (2000), Savage Honeymoon (2001). 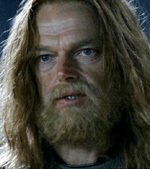 Most recently, he appeared in Lord of the Rings as Gamling. Bruce has three children, Tom, Joe and Francesca. He still lives in New Zealand. Aside from performing, Bruce sings, surfs, sails, visits the elderly and enjoys supporting local charities and organizations such as Auckland Performing Arts Center and the Genetically Engineered Free Lobby in New Zealand.